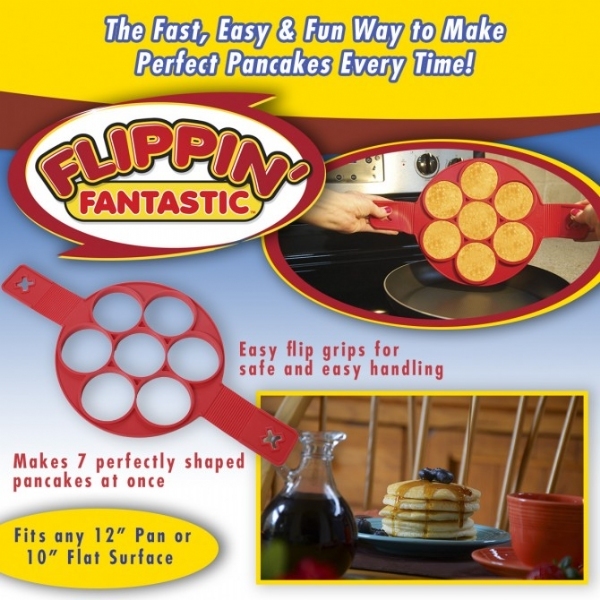 Flippin&apos; Fantastic the fast, easy and fun way to make perfect pancakes every time! As seen on TV Flipppin&apos; Fantastic flips multiple pancakes at the same time and without the mess. Just place in preheated pan add batter and let them brown then simply lift and flip. The secret is the non-stick, silicone ring. The side holds batter to the perfect shape for even cooking, while the flat bottom ring supports everything. Stovetop safe silicone while the easy flip grips keep hand away from the heat. Dishwasher safe. Also great for eggs, omelets, hash browns and so much more! Just what I needed to go woth my Copper Chef grill. We tried eggs and pancakes- what a mess. Item doesn&apos;t lay completely flat so whatever you are trying to cook will seep out.